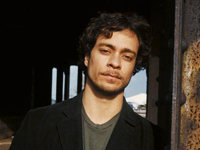 Singer/songwriter Amos Lee draws inspiration from such soul and folk artists of the ’70s as Bill Withers, John Prine, Neil Young, and James Taylor. The Philadelphia native first became serious about performing while attending the University of South Carolina during the mid-’90s. After graduating, the English major taught elementary school before deciding to pursue a music career full-time. A period of waiting tables and bartending followed as Lee honed his songwriting skills.